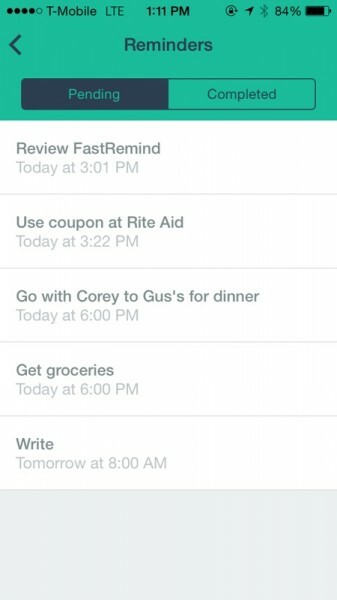 FastRemind ($0.99) by Michael Mase is the fastest way to add and deal with reminders for yourself. 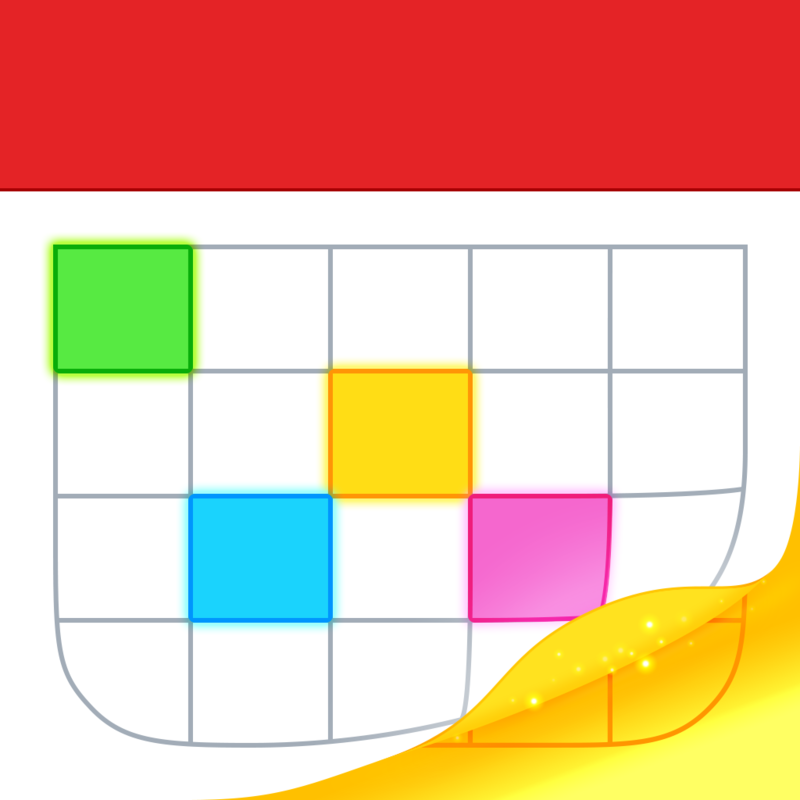 While there are plenty of other reminder apps out there, such as GoodTask and even Fantastical 2, if you want something that is no-frills and fast, then this is the app for you. 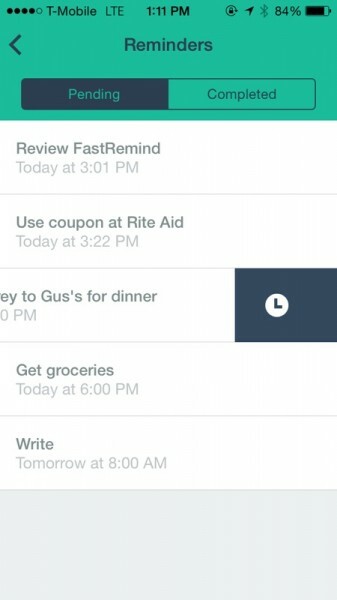 When it comes to apps, I just can’t seem to get enough of productivity apps, mostly of the reminder or to-do list variety. Even though I’ve been a longtime user of OmniFocus 2, it seems that recent entries in the market have me strongly reconsidering (though I haven’t made a final decision, yet). 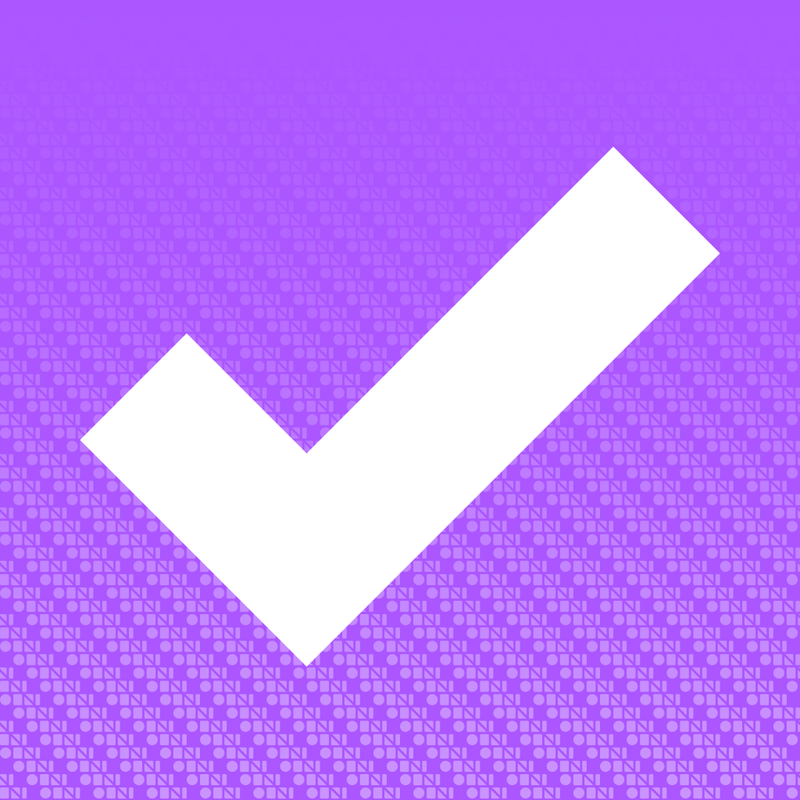 Sometimes, I just need a quick reminder to do something, and I don’t really want to add it into my complex OmniFocus system. With this in mind, I’m glad that something like FastRemind exists. The interface for FastRemind is simple and barebones, placing the focus on quickly adding a reminder and being done with it. 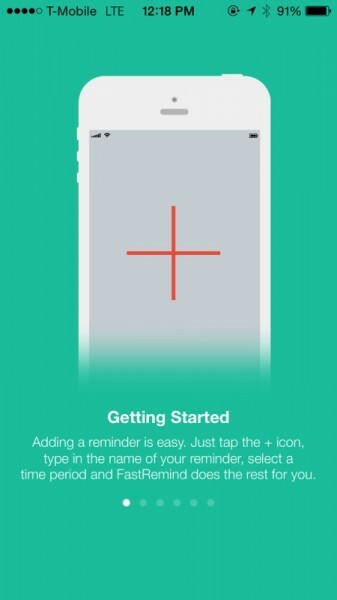 The app will show you a brief tutorial on the first launch, and explain the basics, though I found it to be very straightforward, especially if you’ve used other reminder apps before. The design of FastRemind is flat, clean, and colorful, fitting in well with iOS 7 aesthetics. 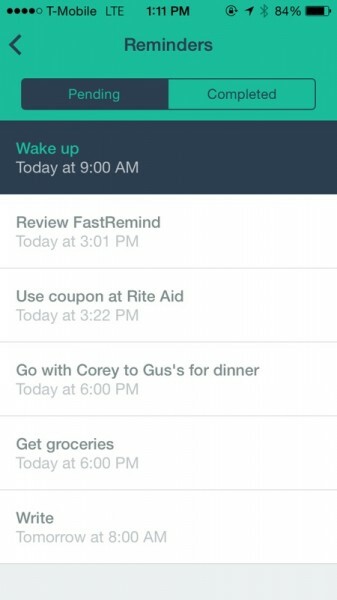 Plus, the app is incredibly easy to use, so there isn’t much of a learning curve — just open it, add a reminder, and go on about your day, just as it should be. 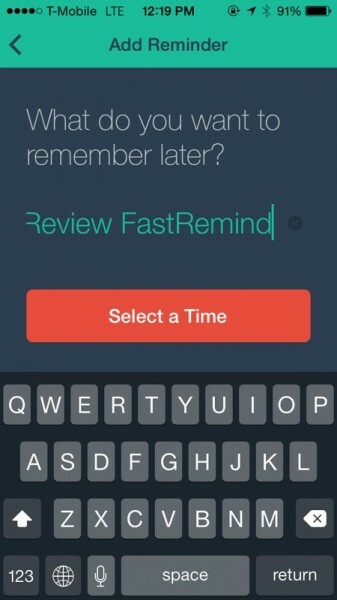 The main view of FastRemind will feature a huge “+” button, which you absolutely can’t miss. This is to ensure ease-of-use when adding a new item, and it’s quickly accessible. 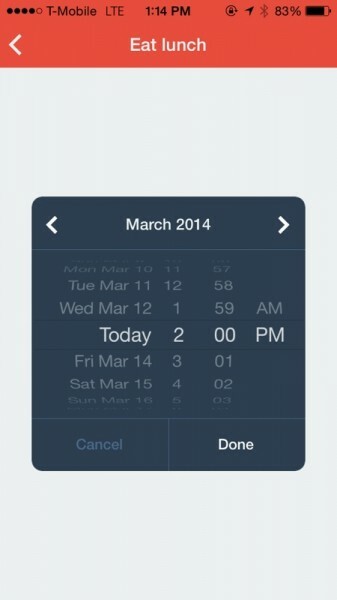 Tapping on the cog in the bottom corner gets you the settings, and the clock shows you existing reminders. As with any productivity app, I recommend checking out the settings first to tweak it to your liking. You can choose the start of the week, the first day of the weekend, what time you start the day or weekday, and what time it ends, as well as the default “later” time. 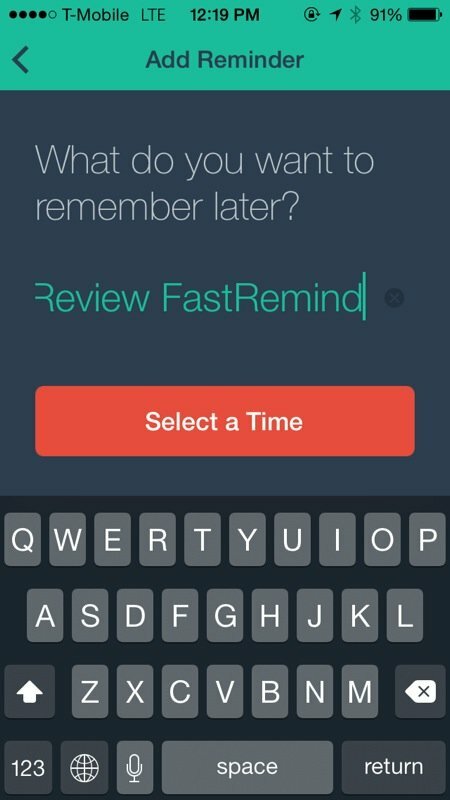 When you add a new reminder, FastRemind basically asks you, “What do you want to remember later?” Fill it out with what you need, and then tap on “Select a Time” to bring up the next step. 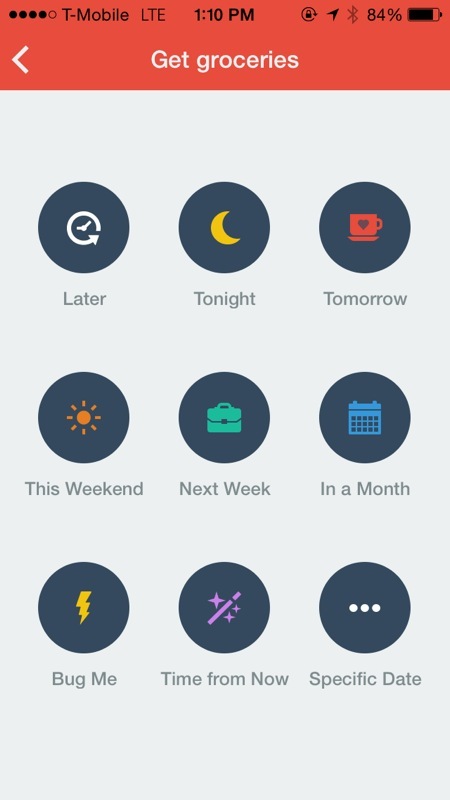 When you select a time, you get a 3×3 grid of circular icons, each representing a different time to be reminded at. 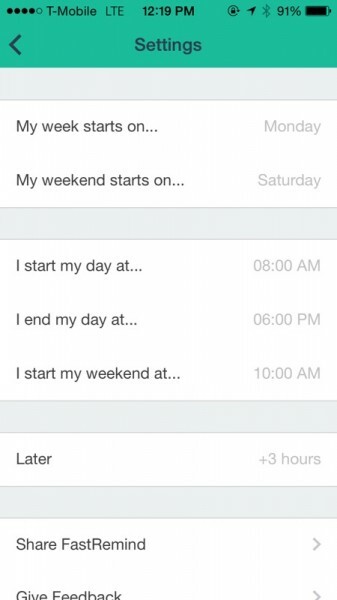 If you’ve used apps like Mailbox before, then this grid should instantly look familiar. You’ll have options for later (default setting is three hours), tonight, tomorrow, this weekend, next week, in a month, bug me, time from now (can even be years), and specific date and time. For the options that involve a custom time, FastRemind uses the standard iOS time picker dial, and you can have it set down to the exact minute, which is nice. Once you’ve accumulated a few reminders, you can view them all by tapping on the alarm clock in the bottom corner of the main screen. 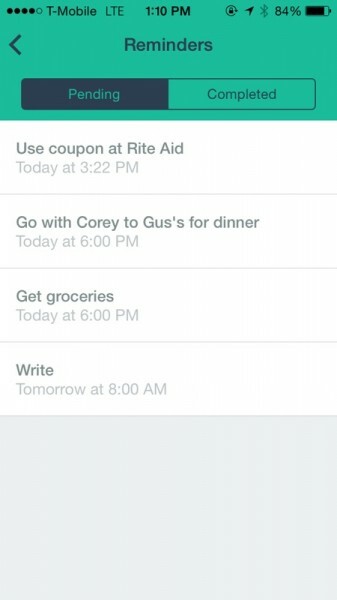 Your reminders will be separated into Pending and Completed. If a reminder is past due, it will be highlighted in navy blue. To mark off an item as complete, just swipe it to the right. 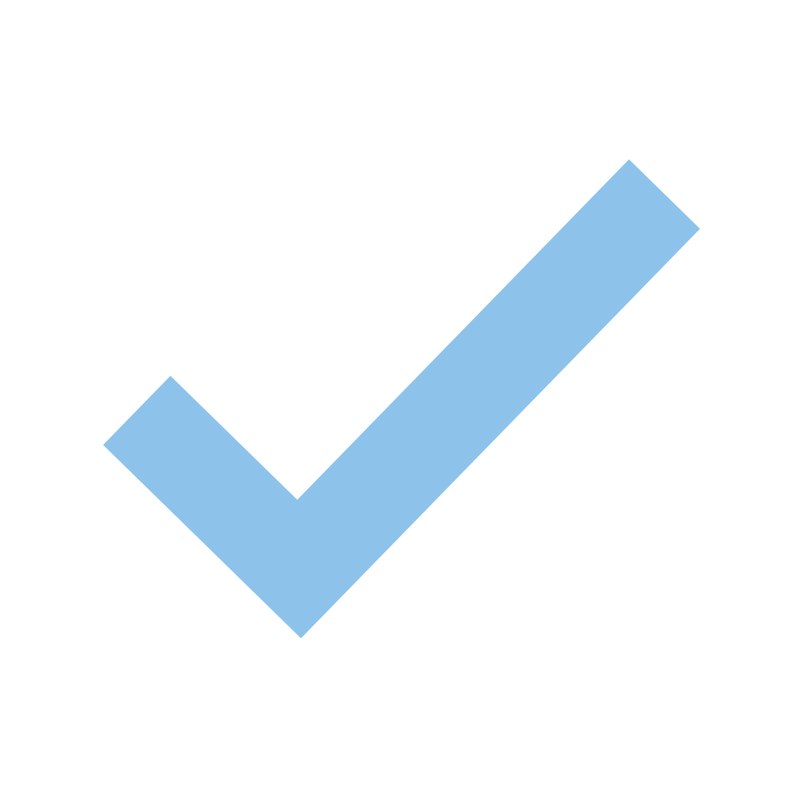 Doing this on a completed task will delete it. 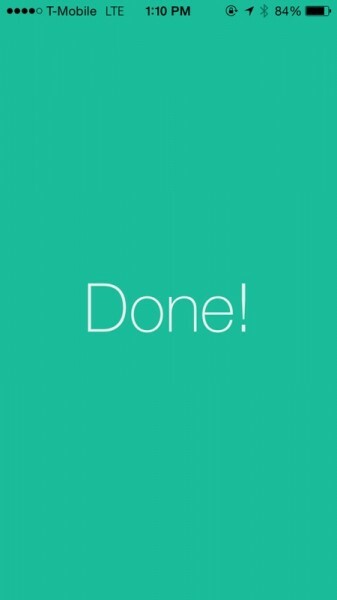 You can swipe left on a pending item to change the time that it is due, and doing this gesture on a done item allows you to reuse it. I really like the simplicity of FastRemind, from the minimal design to the intuitiveness of the app itself. 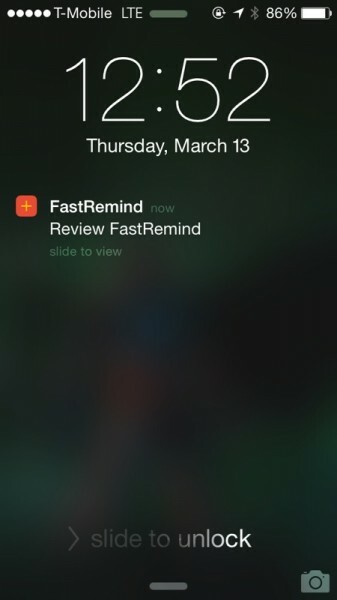 It is definitely one of the faster ways to get reminders into your device, so if you’ve been looking for that factor alone, then this is the way to go. However, be warned that the app does not currently have any syncing, so your data will only be saved locally, which is not that great of a thing when you can set reminders years from now. 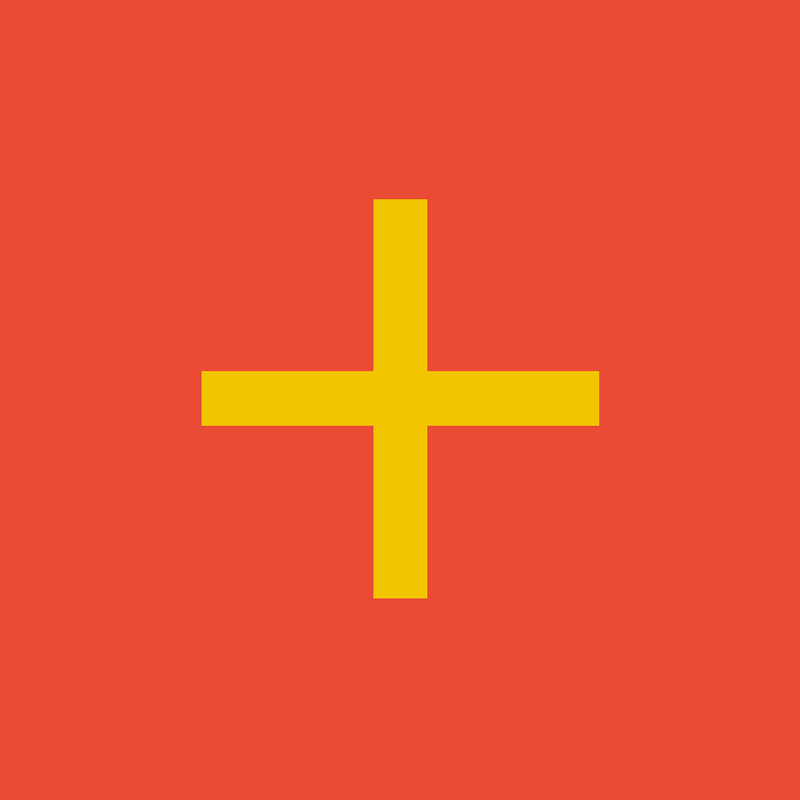 I hope that the developer can implement iCloud syncing or backup somehow, as it would be nice to have your data saved for future use if you switch devices. I would also like to see the ability to add recurring reminders, so you don’t have to keep “reusing” one every day if you need it. 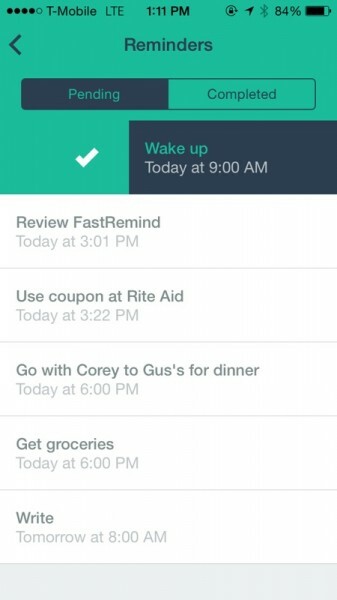 Still, if you just want a way to quickly get your tasks in for later and go on about the rest of your day, then FastRemind is the app for the job. 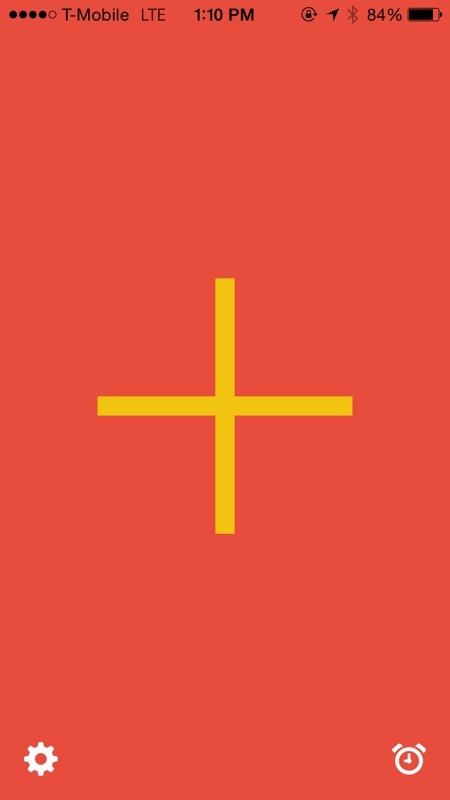 Make sure to check it out in the App Store for your iPhone for $0.99.